This entry was posted in children's books, dog books, dog care, dog training, friendship, guide dogs, PPBF, teamwork, working dogs and tagged Anthony Alex LeTourneau, Beth Finke, diabetes, Guide dogs for the blind, NFB, PPBF, Seeing eye dogs, Southeastern Guide Dogs, Susanna Hill by readingwithrhythm. Bookmark the permalink. Elektra seems to be maturing well, Rhythm. 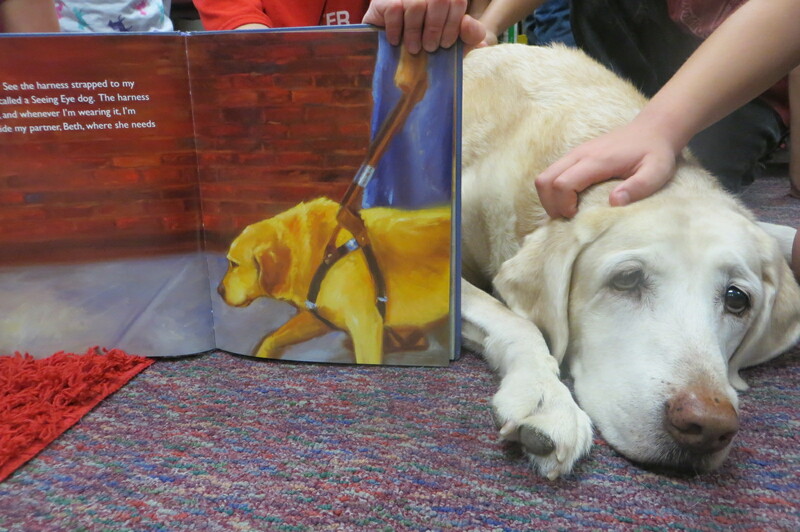 I know kids enjoy stories about working dogs as much as I do. And it is great to teach them little things like the ‘no petting when wearing coat’ rule. It is always tempting as these dogs are so beautifully behaved. 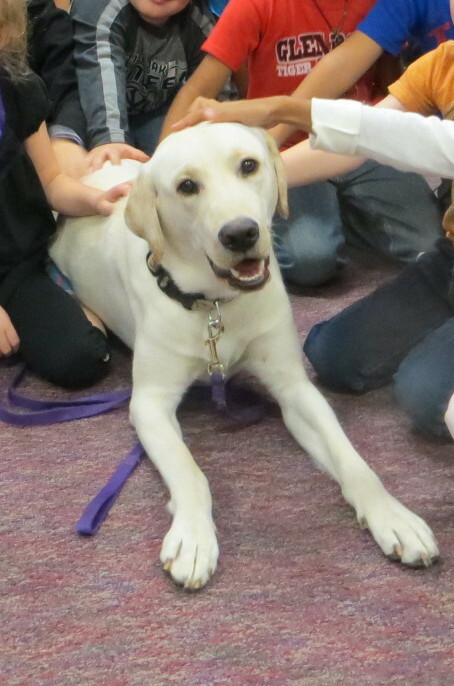 Kids DO love learning about working dogs, Ms Marple! And that rule is such a hard one to follow! i know!! This book is a great read for kids. They are fascinated with guide dogs. Bet this is always in your book bag. Love that T he Today Show has a puppy being prepared as a guide dog and viewers get to watch Wrangler’s progress. Dogs are incredibly loyal. It sounds like this book does a great job exploring an important relationship between dog and human. What a great selection for PPBF! It is a well done tale indeed! Well, I, personally, don’t wear that harness. I was not destined to be a guide dog. Although I did try. But I can tell you that a guide dog needs to be ever vigilant to keep their handler safe. Any kind of distraction, be it hands reaching out to pet or offer treats or voices calling out or whistling or barking, can be a tough thing for a working dog to deal with. It makes things difficult for the dog and the handler. Most guide dog users do put little signs on the harness that ask the public not to pet. Always ask a handler of ANY dog if it’s ok to pet before you just do it! Does that help? It does! And I thought you were an “official” guide dog in that respect. Glad you tried! 😀 Yes, I would think it’s imperative to put a “NO petting” sign. What a fortunate third grade class! It looks like it was so much fun! What a great book! My son is begging us for a dog these days — so he’ll be especially interested in this one. Learning Braille sounds very interesting and like a lot of fun. The Guide Dog resource is excellent! I had no idea that you could volunteer to be a puppy raiser. Maybe when my human puppies get a bit older — we could volunteer. That would be a wonderful way to help and share the joys and trials of raising puppies. Thank you so much! 7 pups! Seems like all of the good things in life make us cry. When my human pups get a bit older we will have to do this — tears and all. Well, whoops! That was a huge communication failure on my part. I meant (but didn’t say clearly at all), when my kids get older — we are going to foster guide dogs. My husband and I talked about it last night and he thinks it is a great idea! I think it will be incredible even if it makes us cry. If I were that apprentice, I would NEVER PUT ON A BLINDFOLD AGAIN! How terrifying! Thank goodness the dog and instructor were on the ball. And that old lady missed her calling as a stunt driver, honestly. Is that not a scary video?! Whew!!!! Amazing!! YOWZA! That was some crazy scene in the video – amazing that they caught it all too! Sounds like a good book for kids! Great book for kids learning about Guide dogs. And Wow for the video. Glad they were all safe. Great book – YES! Scary video – YES! Whew!! So fun!! My best friend Lyla’s mom (who dog-sitted me when Mom had surgery) works at the seeing eye school near us in Morristown, NJ. She is awesome. Seeing eye dogs are wicked smart and also awesome! Well, it’s kind of like you have cousins or something at the Seeing Eye! I don’t think they would let you in for a visit. 😦 But has your Mom been there to visit? Those guide dogs do have to pass some pretty tough tests, for sure! WOW – fabulous dog – and sounds like a fabulous book! Thanks for sharing! That’s great, Rhythm! Seeing Eye Dogs are very important. 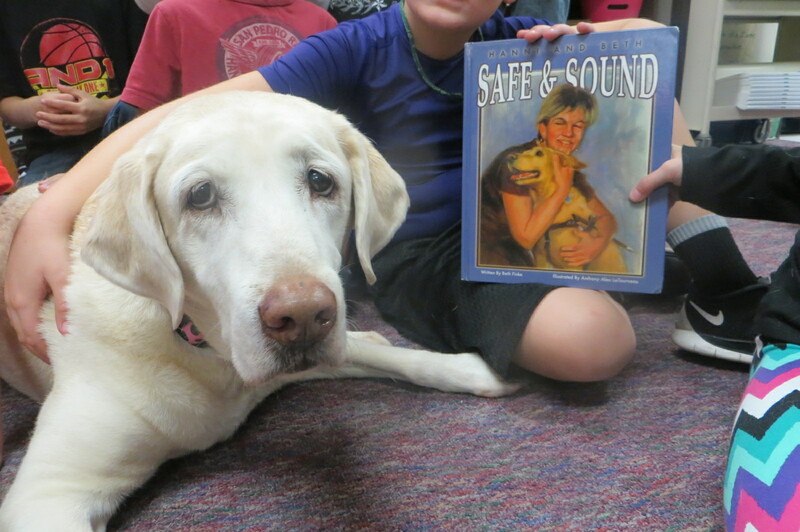 I’m the author of “Hanni and Beth: Safe & Sound” and am absolutely over the moon to discover you use our book during classroom visits – how flattering! Hard to believe it’s been seven years already since that book was published. Hanni is a happily retired Seeing Eye dog now and is living with friends who spoil and love her – she’ll be *FIFTEEN* years old a week from today and still has the energy to run through their local forest preserve during regular visits there. My new Seeing Eye dog Whitney is a cross between a Golden Retriever and a Yellow Lab. She guides me to classroom visits now, and the kids we visit usually read “Safe & Sound” before we get there so they are ready with questions upon our arrival. 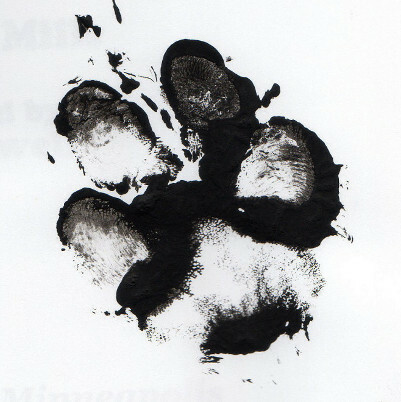 The book Hani and Beth: Safe & Sound was a labor of love and its success is due in large part to the hard work of the puppy raisers, trainers, handlers, editors, publisher, and, especially the illustrator who made it happen. THANK YOU for using it during your classroom visits, you make us all feel good. Wow! and BOW WOW! So nice to have you visit Ms Finke!!! And so glad to hear an update on Hanni! We have had this book in our school bag for a long time and I often wonder what Hanni’s life is like now. I hope Whitney does a good job for you. I know how hard it was to leave my Mom Person when I went off to college, and I often wonder about all those working guide dogs who retire and sometimes go to other homes. It must be a hard thing. And then you have to learn to work with a whole new partner! It’s all heart-boggling to me. We will continue to take Hanni’s tale to school with us. Now we have kind of a sequel to go along with it! Thanks so much!!!! Only 2000 people? Something tells me everyone in Glen Rose must know Rhythm! Hey, I’m hoping to publish a post on my Safe & Sound blog early tomorrow morning that will link to this very flattering review you wrote of our picture book –is there a photo of Rhythm I can takeoff your blog site? If not, could you email a photo as an attachment to info@bethfinke.com that I can use on my blog post? Thanks! Oh! Fun! You are welcome to borrow any picture you like off of this blog! Or I can email you one. Whatever! I got this blog post in my email, but when I go to your blog, I get a page not found message. Thanks for the link though!!! And a BIG Happy Birthday to Hanni!!!!!!! Rats, was having some computer problems yesterday and didn’t realize until this morning that many of my messages didn’t get sent out. Will have to save the photo of Rhythm for a future blog post, I guess! computers. They can be a real frustration. Hope you got it all fixed up!! Perhaps a book will be made of the CCTV footage, it has everything a dramatic tale needs, suspense, a hero and a car chase. I suspect the story may have to be stretched a little when the film rights are sold though. What a great book! I just saw a seeing eye dog in training at the shopping mall today, funnily enough. He was so well behaved and very patient as a group of children invariably gathered around him and were asking all sorts of questions.